Looking for movie tickets? Enter your location to see which movie theaters are playing Life Partners near you. 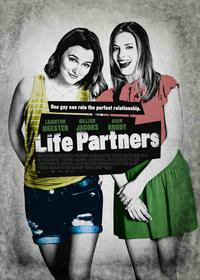 The co-dependent relationship between gay 20-something Sasha (Leighton Meester) and her best friend Paige (Gillian Jacobs) gets rocked to the core when Paige falls into her first serious relationship with sweet but nerdy Tim (Adam Brody). Feeling rejected, Sasha fights to keep their relationship as it always was while refusing to admit to herself that it's time to grow up. Flawed film about friendship has lots of swearing, drinking.